Stephen F. Kemp, M.D., is a U.S. board-certified Pediatric Endocrinologist. Dr. Kemp's educational background includes a BA with from the University of Oregon and an MD and PhD from the University of Chicago. Growth hormone deficiency is a disorder that involves the pituitary gland (a small gland located at the base of the brain). 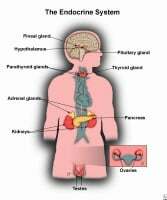 This gland produces growth hormone and other hormones (chemical messengers of the body). When it does not produce enough growth hormone, growth will be slower than normal. If other pituitary hormones are absent or present in inadequate amounts, the condition is called hypopituitarism. Growth hormone deficiency can occur at any age. Growth hormone is necessary for normal growth and development in children. In adults, growth hormone is needed to maintain the proper amounts of body fat, muscle, and bone. In adults, low or absent growth hormone can also cause emotional symptoms, such as tiredness and lack of motivation. The Endocrine System Click to view larger image. For children, the doctor will ask about the child's medical history. If the child's height and weight have been plotted on a growth chart, the doctor will evaluate if the child's growth appears to be leveling off or departing from the child's established growth curve. Past growth patterns are important in determining if the child has a growth problem; the earlier a problem is detected, the earlier it can be treated (if possible) and the better the chance the child has at reaching his or her full growth potential. The doctor may perform blood tests to determine if a hormone deficiency or other disease is present. X-rays may also be taken to check how the child's bone size compares to the child's height and chronological age. In adults, blood tests may be performed to determine if a hormone deficiency is present. Adults with growth hormone deficiency may also have increased levels of total cholesterol, low-density-lipoprotein (LDL) cholesterol, apolipoprotein B, and triglycerides. Other tests that may be performed include CT scan and/or MRI of the brain and/or bones. Images from these tests may reveal tumors or reduced bone density. Growth hormone deficiency can be treated with growth hormone replacement therapy. A drug called somatropin or growth hormone (Nutropin, Genotropin, Norditropin, Saizen, Humatrope, Tev-tropin, Omnitrope) is injected into the fat underneath the skin. A growth disorder is any type of problem in infants, children, or teenagers that prevents normal growth. Normal growth depends upon several factors, such as nutrition, genetics, and hormones (chemical messengers of the body) (see Anatomy of the Endocrine System). Hormones are necessary for normal growth and development; they regulate the body's growth, metabolism (the physical and chemical processes of the body), and sexual development and function. 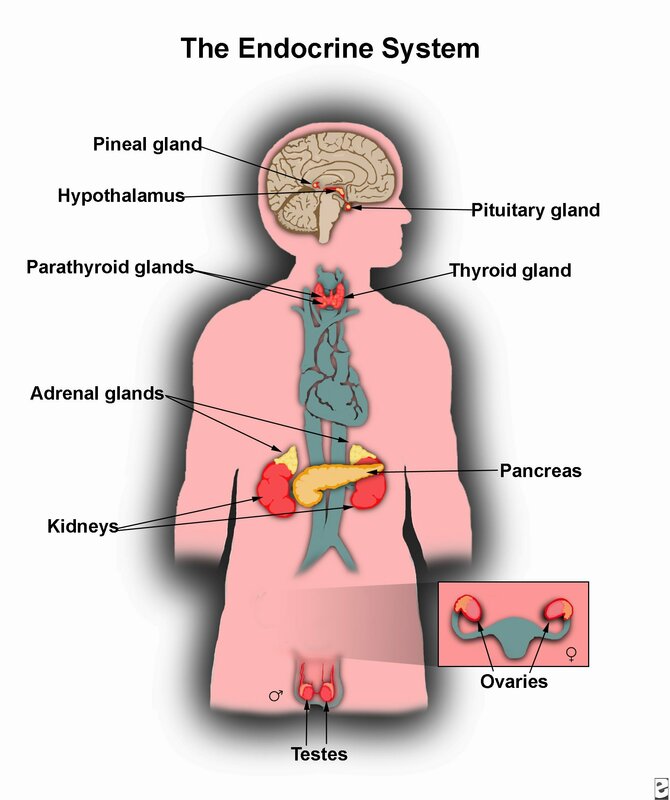 Endocrine (hormonal) causes of growth disorders include thyroid hormone deficiency (hypothyroidism), growth hormone deficiency, hypopituitarism, or other hormone disorders. However, some growth problems are not necessarily growth disorders; normal variants of growth patterns include genetic short height (familial short stature) and slow growth/delayed puberty (constitutional growth delay). Although growth hormone was originally used to treat growth hormone deficiency (this group of patients respond the best to growth hormone therapy), there have been other conditions for which growth hormone therapy has been approved for use. These include Turner syndrome, chronic renal insufficiency, Prader-Willi syndrome, and children who were small for gestational age and have not caught up in their growth by the age of two years. In 2003 the FDA approved the use of growth hormone for children who have "Idiopathic Short Stature," that is, children who are quite short (more than 2.25 SD below the mean in height), and who are unlikely to have an adult stature in the normal range. A child's growth pattern is an important part of determining normal growth. No child has a perfectly steady growth rate; children go through growth spurts and periods of slower growth. The best way to evaluate a child's growth pattern is to plot the child's height and weight on a growth chart. This can be completed by a doctor or a health care practitioner, at school, or even at home. The growth chart will show the child's growth over a period of time. Any departure from a prior growth pattern appropriate for the child's genetic background may signal the appearance of a disease. Contact a doctor or healthcare practitioner if the child's growth or height is a concern. The doctor may suggest seeing a specialist who can perform tests to determine if the child has a hormone deficiency. "Diagnosis of growth hormone deficiency in children"
Does your child have growth hormone deficiency? Please describe your experience. What treatment did your child receive for growth hormone deficiency?